PatternReview.com is having a Sweater Knit Contest, which closes today. You can check out all the entries here. I ordered a couple of sweater knits a few weeks back and this contest was the motivation I needed to get them sewn up. First up I used some 70% merino lambs wool, 30% acrylic sweater knit to make a version of McCalls 6886. This sweater knit is quite a good (heavy) weight, and with a lot of stretch. To determine which size to make I followed some advice recently offered by Beth, who advised measuring out knit fabric to the size stated on the finished pattern measurements and wrapping it around your body to determine what size to sew. I ended up sizing down by two sizes to compensate for the stretch in this knit. Full review below, but general conclusion is that I like this dress. 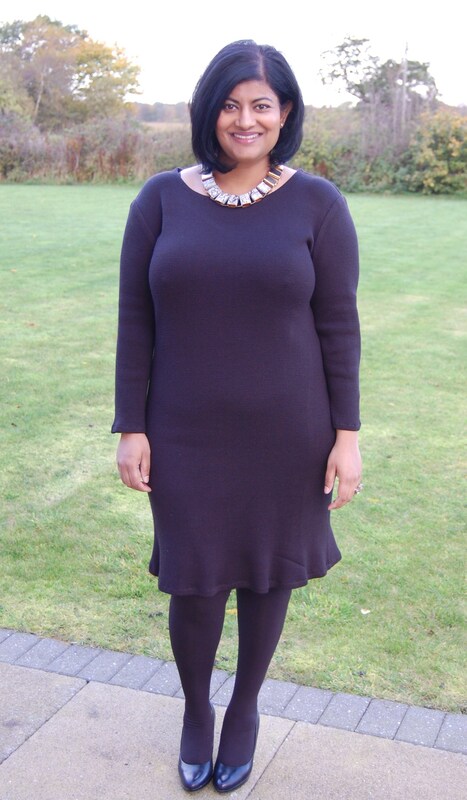 It feels lovely and warm and is very easy to throw on over tights and boots. The one thing I am not 100% happy with is that my hems have got a bit of that wavy look to them. I should say that for both the garments shown in this post I sewed all the seams using my lightening bolt stitch on my regular sewing machine, and finished all seams on my overlocker. I did test on samples first for the hemming of this dress and it looked fine, but the actual hems have gone a bit wavy. So perhaps I should have interfaced them? 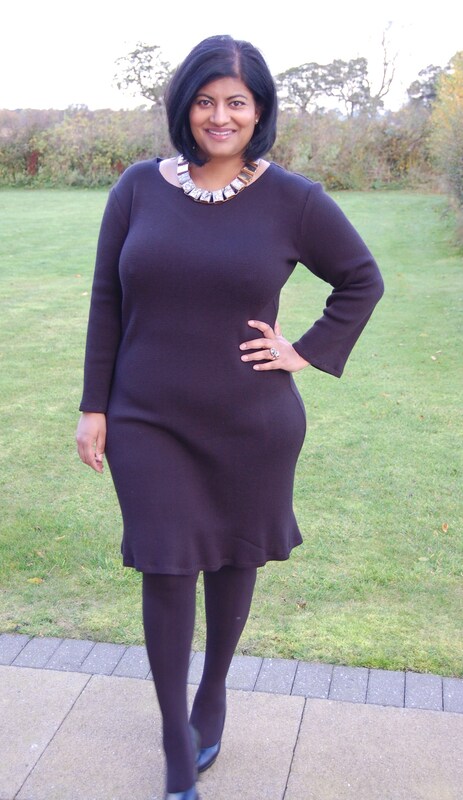 Close-fitting, pullover dresses have neckline variations, and stitched hems. E and F: neck bands. I made view A with the sleeves from view C.
This is such a popular pattern and I can see why. It is easy to sew, quick to make and very easy to wear. Nothing to dislike really. 70% merino lambs wool, 30% acrylic sweater knit. I ended up sizing down 2 sizes to compensate for the stretch in this fabric, but took only 3/8th inch below the bust at the side seams. I added one inch to the length (of view A). I added 1 inch to the sleeves (of view C). I added clear elastic to stabilise the shoulders and prevent stretching out. I set the sleeves in flat. I turned and stitched all hemlines (taking only 5/8th inch for all; I wish I had interfaced the skirt and sleeve hems). At time of writing 73 other reviewers on PR.Com can’t be wrong: this is one pattern to definitely have in your stash. 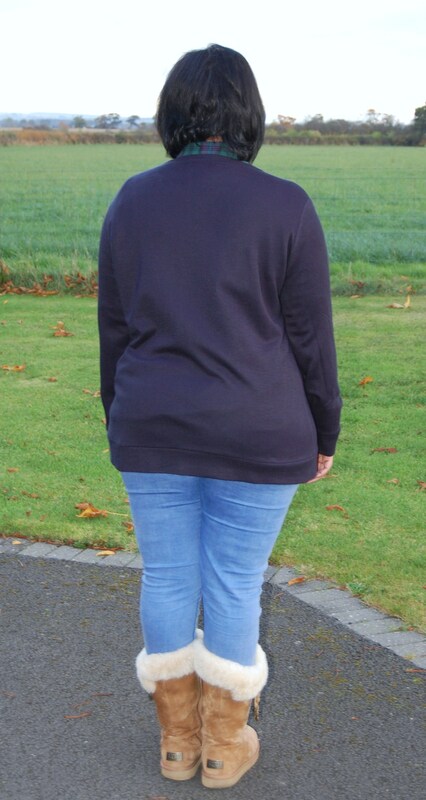 Next I used some french navy knitted jersey (75% lambs wool, 25% acrylic microfiber jersey) to make a Jenna Cardigan by Muse Patterns. (Sorry, but this fabric was purchased from the same ebay seller above and they seem to have sold out now). Again, this is a very popular pattern on the internet, and I can see why. I LOVE how great this looks. In case anyone is wondering, I have lengthened this cardigan by 4 inches to get a more relaxed boyfriend style (i.e. bum coverage). 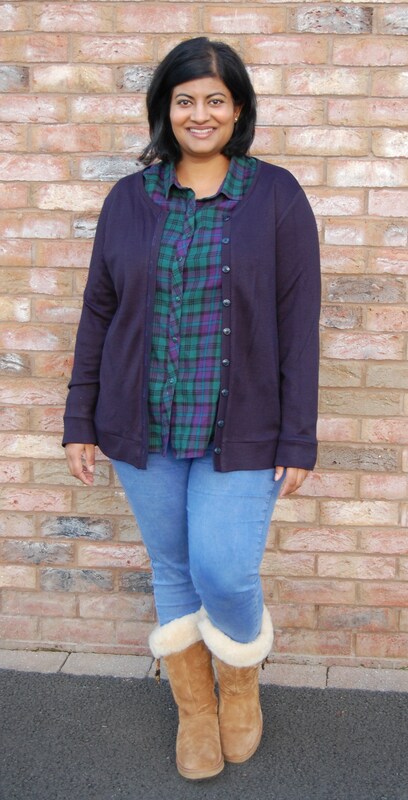 I have a RTW cardigan like this and based the measurements off that. Again, full review below but I will definitely make this pattern again…if I can find the right fabric. Yes, but I lengthened this particular version. I LOVE the finished garment: it looks so RTW. There is not much to dislike…but I would have liked to have had lengthen/ shorten lines on the pattern and there is no grainline marked on the front piece. Ended up removing a total of 3 inches from the length of the sleeves. Narrowed sleeves by approx. total 1 inch below the elbow. 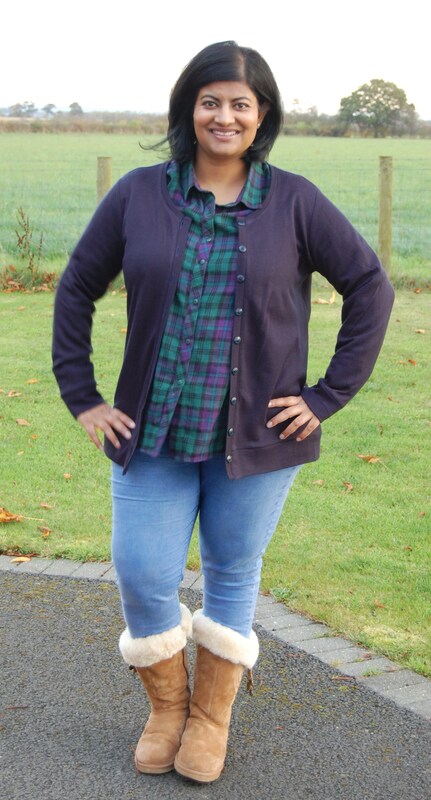 Lengthened body of cardigan by 4 inches (and button band; added an extra button to compensate for extra length). Approx. 0.5 inch sway back adjustment. The only thing stopping me from making more of these cardigans is finding the right fabric. The search commences…. Are we at November already?! Where is the time flying too? Happy sewing! Both the dress and the sweater look beautiful! I love both pieces. You know, I thought the wavy hem was a cute design feature and I like it. I haven’t used a sweater knit (so hard to find nice ones here!) but for jersey knits I sometimes interface skirt hems with a very light weight fusible tricot and that works fairly well. Thanks Jen. I have the dress on right now so the hem doesn’t bother me that much! wow that color is gorgeous on you, great sweater knit pieces. I really like both of these on you. I agree with Jen, I thought the hem was a feature of the dress and I like the effect. How did you do a swayback without a centre seam? What instructions did you follow? Ps with the hem perhaps the overlocker stitch needed adjusting for a stretch fabric? Thanks Rachel. In Fit for Real People they say take a horizontal tuck for one piece backs…so that is what I do. Yes it adds a little bit of width in (less than 1 inch?) when you cut on the fold but this is what works for me. Thank you. I have just tried the sway back on a blouse (the same pattern as your red polka dot) for such a simple adjustment it really makes a difference. Mine looks great in a silver and turquoise large Paisley design with a hip sash. Perfect for Christmas. I found your comments so useful as the neck would have been too high if I had followed the pattern! Keep on blogging. Both are beautiful pieces. Well done! Question: How did you do the sway back adjustment on M6886? I love that pattern, but I seriously need s sway back adjustment – about an inch – and I haven’t figured out how to do it, because the back is a single piece. A little help for the geometry challenged over here? Thanks! Hi thanks. In Fit for Real People they say take a horizontal tuck for one piece backs…so that is what I do. Yes it adds a little bit of width in (less than 1 inch?) when you cut on the fold but this is what works for me. I typically need to do a 1 inch sway back adjustment and do this as standard. Both of these pieces look fantastic on you! The plaid Archer is really cute, too. +1 to wanting to know how you your swayback adjustment. I typically need one but have trouble wrapping my head around how to do one on garments that don’t have some sort of shaping (either a CB seam or darts) in back. Don’t sweat the ripply hem – it looks great. Thanks Ali. I have already worn both pieces loads! SUPERB YOU HAVE A WONDERFUL TALENT THANK YOU FO SELECTING OUR FABRICS IT A PLEASURE TO SERVE YOU . Both the dress and cardigan are fabulous. That dress is so elegant and beautiful. The waviness of the hem on the dress looks deliberate and adds an element of fun to the dress. Bravo! Very cute! I think the wavy hem on the dress is flirty and fun. Great color on you!